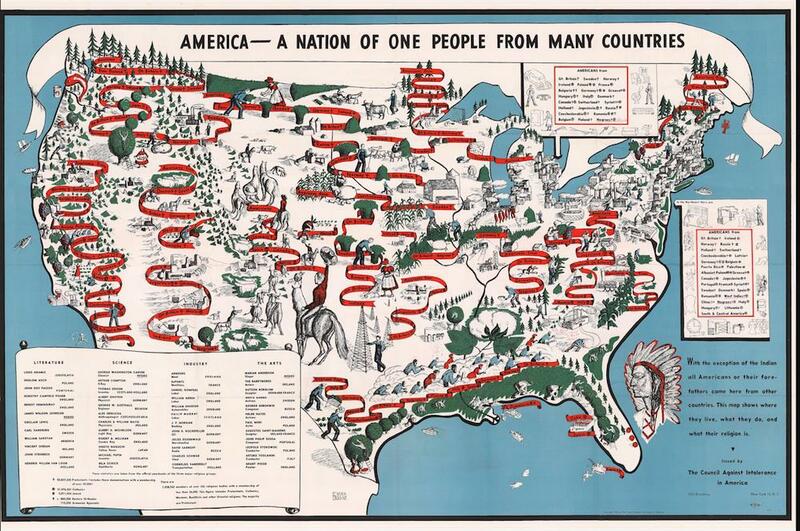 This map, issued by the Council Against Intolerance in America in 1940, shows the ethnic groups living in the United States, offering a picture of their geographical locations, typical employment, and religious commitments. The document was owned by poet Langston Hughes, and is collected in his papers at Yale’s Beinecke Rare Book & Manuscript Library. The Council Against Intolerance, a New York group active from the late 1930s through the mid-1940s, was founded by left-leaning Jewish author James Waterman Wise. Wise is notable for having warned of the dangers of Nazism in several books as early as 1933. The Council’s educational department printed teachers’ manuals and books to be used in adult reading groups. The group’s rhetoric was pro-American, arguing in its materials that prejudice would undermine national unity in a time of war. The map’s images in the Southern part of the United States, of African-American and white sharecroppers bent together over bales of cotton, seem to have provoked Hughes to commentary. In a red pen (now faded to pink), he drew a burning cross near the workers, writing “KKK” underneath. Beinecke Rare Book & Manuscript Library, Yale University.